Brighouse Light Opera Society has came a long way since its beginning in 1924 as St James Operatic and Dramatic Society. Show venues have changed over the years – the Sugden Memorial Hall, the Parish Hall and the Albert Cinema, with a feel of theatre, from 1948 to 1970. Then it was back to the Parish Hall under its new name of Rydings Hall and latterly to our present home in the Brighouse Civic. 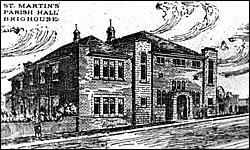 Concert parties were a large part of the Society’s past and there was hardly a church in the Brighouse area that did not receive a visit from the BLOS Concert Party for its Autumn Bazaar, Spring Fayre etc. Hospitals were not neglected and in the days when none of us had cars, a Huddersfield Corporation bus provided concert party members with transport to Huddersfield and then out to Mill Hill and Dene House Hospitals. This is a tradition which the Juniors kept alive with their regular visits to Kenmore Cheshire Homes. Brighouse Theatre Productions was established in 2005 by the merger of two long established musical theatre groups, Brighouse Amateur Operatic & Dramatic Society and Brighouse Light Opera Society. Both of these organisations, which had been in existance for over eighty years, first came together to jointly lease and manage their present headquarters at Wilkin Royd Mill. Despite misgivings by some members of both societies, the formal merger in May 2005 was seen as a logical extension of this period of close cooperation. 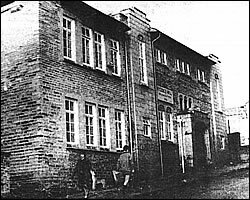 Brighouse Light Opera Society originally used the Albert Theatre to stage shows. Built in 1899 at a cost of £4,000, the theatre seated 1200 on three levels. Provision was made for electric lights and the act drop depicted a scene from Constantinople. In the 1930s this was all swept away and replaced with a rather dull cinema auditorium. Most of the stage was incorporated into the enlarged auditorium – the tower is of greater depth outside than the space now existing behind the present plain proscenium. There is no trace of the original layout of the Albert nor any features surviving from the theatre. Further changes have been wrought since the cinema closed and bingo took over. A staircase has linked the stairs with the circle, adjoining properties have been purchased and incorporated etc. The theatrical significance of the Albert has been much reduced but given its location, close to Halifax, it should not be written off without careful consideration of its potential. Through the 1970’s and 1980’s Brighouse Light Opera Society presented their October show in the Rydings Hall. This was rented from the Brighouse and Ratrick Band. The following is a brief history of the hall from the point that the band decided to purchase the hall. 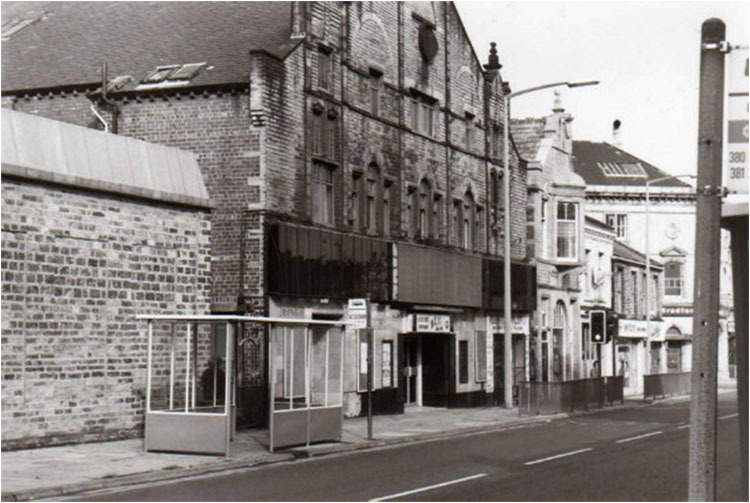 In 1966 Brighouse Corporation put plans forward for road improvements including the Ludenschied Link Road, which was to go through the middle of the Odd Fellows Hall which was the rehearsal room for the band. Eventually a compulsory purchase order was served and alternative accommodation had to be found by the band. This was eventually achieved with the purchase of St. Martin’s Parish Hall in Church Lane in 1970. A great deal of renovation and preparation work had to be carried out. In a report of the official opening of the new facilities, the ‘Brighouse Echo’ picked out a few names of volunteers who had helped – Messrs Lakey, Lord, Merrifield, Murray, Noble and Smith, as well as members of the Brighouse Light Opera Society. The Mayor of Brighouse, Coun. W. Stanley Firth, carried out the official opening of the new bandroom – now named ‘Rydings Hall’, on 25th September 1971. The proceedings concluded with a concert given by the band with contributions from members of the B.L.O.S. This hall provided not only rehearsal facilities but an auditorium that could seat almost 500 people. The band could now promote its own concerts in its own hall, and several other local organisations benefited from this facility. Many fine recordings we made in the hall by B & R and some other bands including the Virtuoso Band of Great Britain, which was a combination of players drawn from all the top bands in the country. In the late 1980’s problems began to occur with the building and its management. The handful of people who looked after the hall for the band were not getting any younger. Some lived locally but others lived out of town and were not often readily available at short notice. Most regrettably, vandalism was on the increase. It was therefore decided by the band committee and to sell the property and look for suitable smaller accommodation elsewhere in the town. As the hall shut down B.L.O.S. transferred production of the shows to the Civic Hall in the town centre.